Yogurt is added to this recipe in place of some of the fat, which along with the chopped apples creates a really light and moist cake. As this cake is not too sweet, it is also perfect with a cappuccino for a mid-morning or afternoon coffee break. 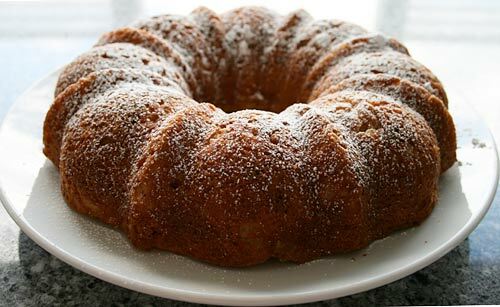 I used a fluted bundt pan for my cake, but a tube pan would work just fine. I prefer to use Granny Smith apples for baking as I love their tart flavor, but feel free to use your personal favorite baking apple in this recipe. Yogurt replaces a good deal of the fat in this cake, reducing calories from fat and increasing nutritional value. A moist apple cake that stores very well. Grease and flour a 12 inch bundt pan. Add eggs and and vanilla and mix until smooth. In a separate bowl, mix together the flour, baking powder, baking soda, and cinnamon. Add this dry mixture 1/3 at a time, alternating with yogurt. Mix after each addition just until combined. Fold in the apples and pour into the prepared pan. Bake for about 35 to 40 minutes or until a skewer comes out clean. Cool, and if desired, sift a little powdered sugar on top before serving.